Seems that Airtel has reacted very fast to the Reliance Jio's Prime offering. In the latest move, Airtel is offering industry's cheapest data pack at Rs 100 to offer 10 GB of 4G/3G data to the postpaid users. 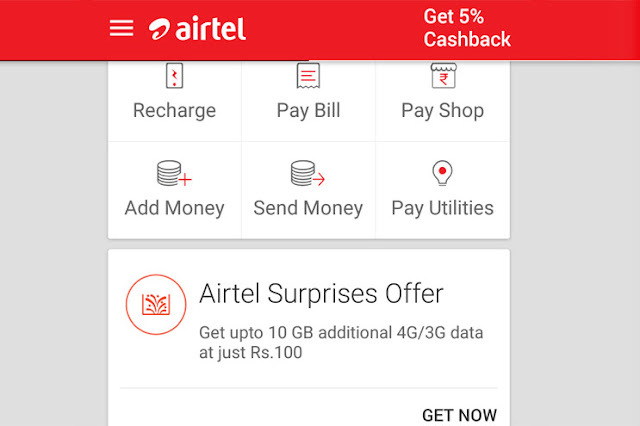 'Airtel Surprise Offer' will be in addition to the existing data provided to the customers on their postpaid plans. For example, if a customer is on Postpaid plan, Rs 549, as per the plan, he gets 3 GB of 4G/3G data and in addition, he gets 10GB data if pays another Rs100. It is also rumored that Airtel is also planning to launch similar data packs to the prepaid customers as well soon. To recall, Reliance Jio has introduced Jio Prime to its customers at Rs 99 for complete one year. The Jio Prime customers can opt for unlimited data and voice plan by paying Rs 303 per month till March 2018. The move by Reliance Jio have shaken the telecom industry and the operators are designing their own plans and packs to retain at least their high ARPU customers.